A student has sent a massive list of demands to her future housemates, before they even met. Ashly, who will begin studying at UCLA later this month, sent a big list of aggressive demands about what bunk and desk should be hers to her future roommates via email. The list of demands has since gone viral, after her future roommate Winnie Chen shared it on Twitter. 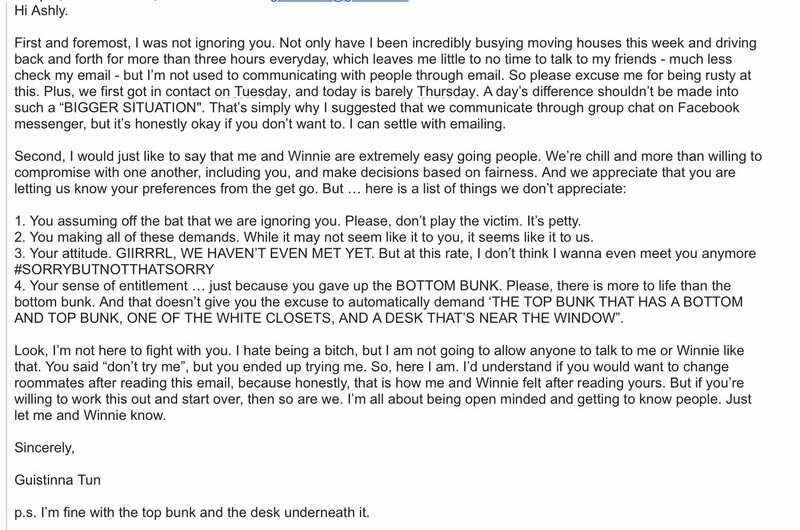 The first email reprimands Winnie and Guistinna for not responding to a previous email, before going on to inform her new roommates exactly which bunk and desk she was taking. In the third email, Ashly both apologises and describes herself as "really chill" and "a ticking time bomb" with anger issues.